Do You Need to Replace All 4 Tires on Your AWD Vehicle? Here’s why it may be better to replace all four AWD tires at once. A new tire is larger in diameter than one of the same brand, type and size that’s partway through its tread life. This means there’s a measurable difference in tire circumference that may affect your vehicles’s performance. To understand why this matters, think of two horses of unequal size at gallop. The taller horse covers more ground in a single stride than the smaller horse. Over the miles, the smaller horse will take more strides and run harder to keep up. The same is true for mismatched tires. A taller tire (one with more tread depth) travels more distance in a single revolution than a shorter tire (one with less tread depth). To keep up, a tire with less tread will spin faster, revolving a bit more than one revolution for every revolution of the tire with more tread depth. Here’s an illustration showing how even if a tire is labelled the same size, the tire with less tread depth (the shorter/used tire) will revolve more times than the newer (taller) tire with more tread depth. So why is mixing new tires with used on an AWD a potential problem? First, even a slight difference in diameter between tires on your AWD can mean trouble for the drivetrain. These are the parts of the car that transfer the power from the engine to the wheels to move the vehicle forward. This is because the heat that builds up from the effort of the smaller tires “trying to keep up” creates stress on the transmission and axles that can result in expensive repairs. Second, if the two tires on one axle are spinning faster than the others, your car’s electronics may think those are slipping, and may transfer power incorrectly for your current driving conditions. Most AWD systems in today’s cars include sensors at each wheel that monitor traction and wheel speed hundreds of times per second. This is what allows the AWD system to adapt to slick conditions, by sending power to whatever wheel(s) have the most traction. When smaller tires are spinning faster, some systems may put your vehicle into four-wheel lock, the mode used for driving in slippery conditions. 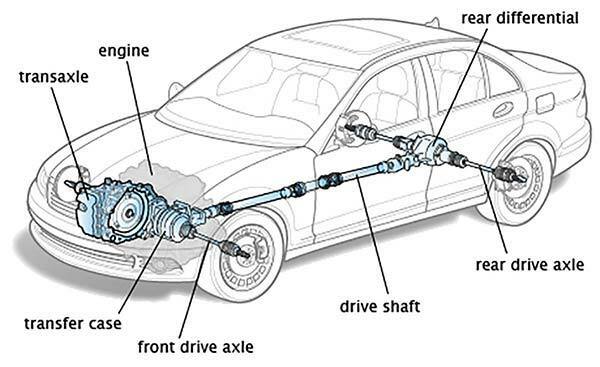 That’s a no-no, since driving in that mode on pavement or at speed can cause damage to your vehicle’s drivetrain. If two of your tires are due to be replaced (Hint: use the penny test to find out), it’s absolutely essential to check your vehicle’s owner’s manual to see if it recommends replacing all four of your AWD tires at once. Look in the tires and transmission sections. Or call your auto dealer for your make and model and ask the service department. Ignoring this advice may result in costly damage to some of the most important driving components of your car, like the transmission. Any reputable tire dealer will follow what the car maker says to do. And almost all manufacturers agree that you should replace all four. Also, get a tire pro to use a tread depth gauge to accurately measure the tread if you think two of your tires still have some tread life in them. If there’s more than 3/32nds difference in tread depth between your new and keeper tires, spring for a full set of four new tires. Even that much of a difference really matters. Mismatched tires are often a primary factor in drivetrain damage. To minimize variances, always match tires: same brand, size and type. The tread depth difference between front and rear tires should be no more than 3/32nds of an inch. If it is, you’ve got a problem with tire circumference difference. Get all four tires replaced. Not sure if your auto is AWD (or four-, rear- or front-wheel drive?) Check your owner’s manual and read up here on the differences.